Let's get a few things straight about me: I love to shop, I love fun restaurants, and I love day dates with my husband. How do all these things add up to a perfect lunch date and shopping day with Justin? Let me tell you. The town I live in is small but wonderful. Due to its size however; I end up going out of town to do most of my shopping. More often than not, Justin and I head north to the Daytona Beach/Orlando area when we have any major shopping to do. Since Justin is a firefighter who works 24 hour shifts, we don't get to spend as much time together as we like so once a month we usually make a "day date" out of one of our out of town excursions. And if you're anything like me, a day date MUST include a fabulous meal. It's not a date if I'm not eating good food. So we headed to BJ's Restaurant to try out their new Big Poppa Smokers BBQ menu. Not only was it the perfect choice for our day date but it also made Justin so happy he even let me shop longer than usual afterwards. 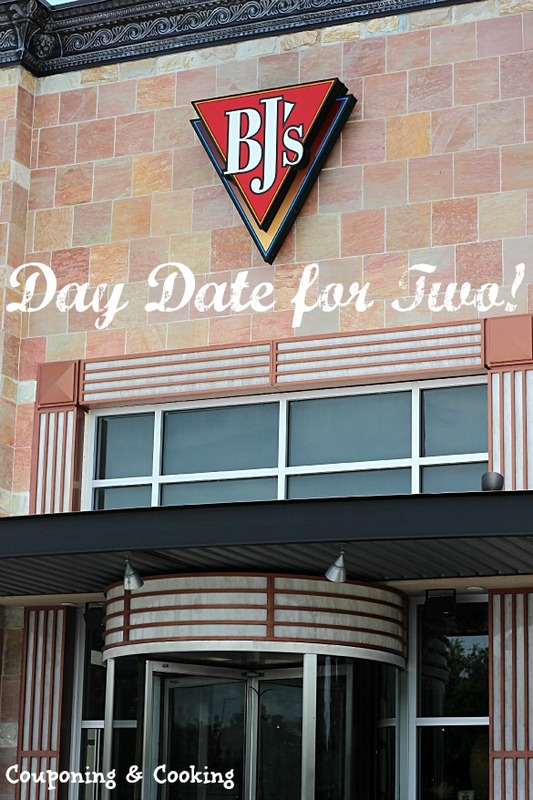 Every time we go shopping, we pass the same BJ's and every time I beg Justin to go but we are always on such a schedule and we have to get back home or have to go and meet friends or family somewhere and we can never stop. 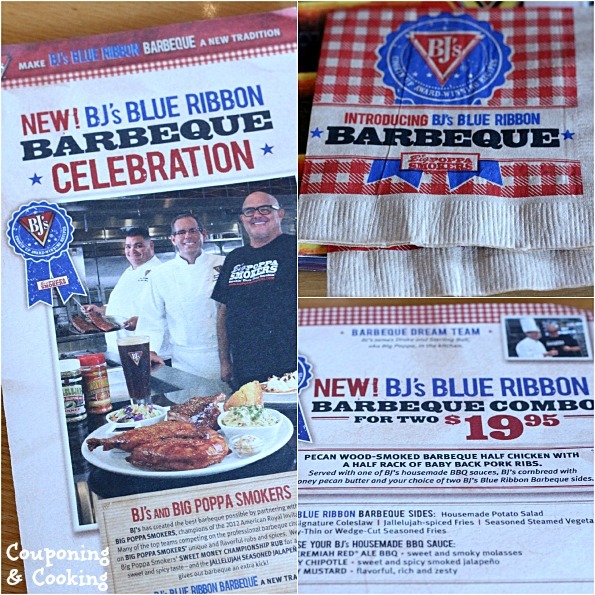 Needless to say, I was beyond excited to get the chance to not only eat there but to try out their new BBQ menu from Big Pappa Smokers. From the minute we walked in, I knew we were going to have a great meal. The atmosphere is fun and casual and the tables and booths are far enough away from each other that you really get a chance to talk and relax, which is key while on a day date. 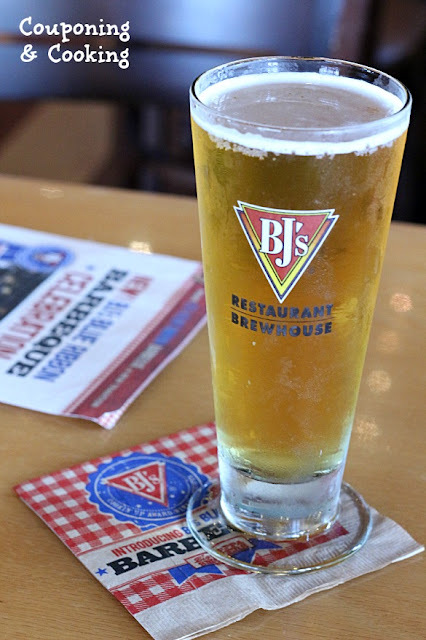 After a lot of deliberation, we decided to start with the Corn Fritters with Bacon Aioli and Justin ordered a BJ's Brewhouse Blonde because when it's a day date, it's completely ok to drink at lunch. I was dying to order one of their yummy looking cocktails but thanks to my recent gallbladder surgery I had to pass. 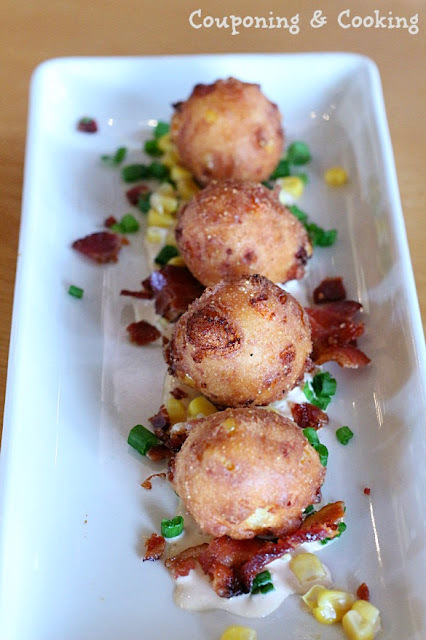 The corn fritters were golden brown perfection with just enough spice and the bacon aioli was ridiculously good. I could have eaten at least fifty of them. Thankfully, they were portion controlled or I would have never been able to eat my lunch. 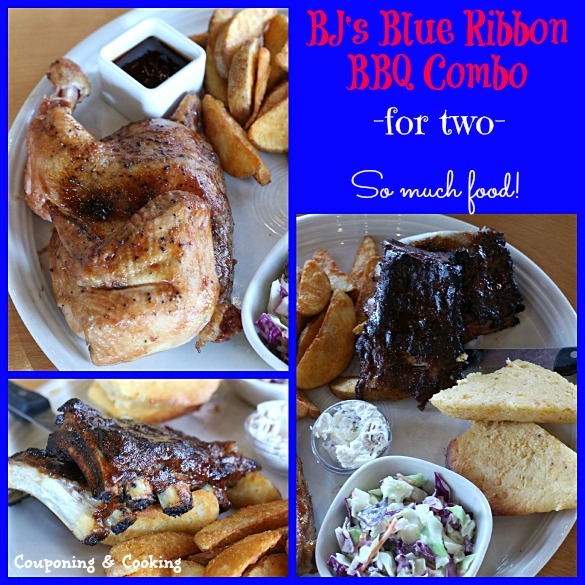 For lunch, we decided on the Blue Ribbon BBQ Combo for two since we really wanted to try everything. It came with a half rack of ribs, half a smoked chicken, potato wedges, cole slaw, and two huge pieces of corn bread with honey pecan butter plus a choice of bbq sauce for dipping. Everything was amazing. The chicken was so moist it was falling off the bones, the ribs were perfect and I can't even describe the cornbread. I have to admit that I may have eaten a few bites of Justin's piece too. It was a massive amount of food and I am slightly embarrassed to say we pretty much cleaned our (very large) plate. 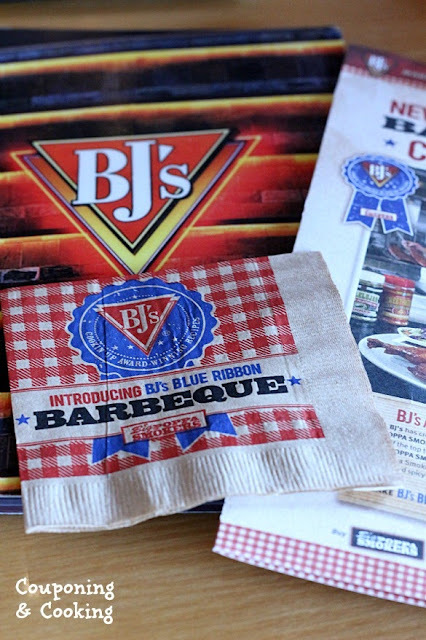 The Big Poppa Smokers BBQ menu and specialty offerings are going on through September 9th so we will definitely need to go back and eat from it a few more times before then. Make sure to stop in and check it out! You won't be sorry! Check out Big Papa Smokers online too!